The department offers a 3-week ambulatory-based clerkship position for students of North American medical schools interested in a career in Family Medicine. Because of our teaching responsibilities to UCLA students, the number of spots for outside students is limited. During this rotation, students are assigned their own patients and are expected to participate in didactic sessions and discussions. A formal student lecture series which focuses on health care issues that impact the underserved is part of the elective. The clerkship places an emphasis on health for the underserved and pays particular attention to ways of improving the healthcare of the medically underserved communities in our inner cities. Students will be exposed to community, public health, and healthcare policy and participation in our monthly homeless clinic is mandatory. Students will be accepted on a first-come basis, first-served basis; senior students will not be accepted for an elective scheduled after February. We cannot accommodate first and second year students. This elective is handled through Office of Student Affairs at the David Geffen School of Medicine at UCLA and requires an application fee (payable to UCLA) of $150.00. Applications are available online from the UCLA website (look under ‘Visiting Students’ link). Please read the clerkship rules and policies before completing an application. We also ask that you include a personal statement about your career goals. Requirement: Medical student applying for the clerkship must have completed their pediatric and medicine clerkships. All materials should be sent to the course coordinator at least 8 weeks prior to the start of the rotation. 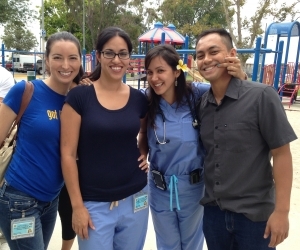 For the past 16 years, medical students from across the country come to Harbor-UCLA Department of Family Medicine to work alongside family medicine residents, undergraduate and high school students in a community based project for 6 weeks during the summer. Working in teams they learn about health care disparities and issues facing our underserved and marginalized communities. They learn the fundamentals of community based research, health policy and advocacy, provide health education talks to the community, and plan and implement 2 community health fairs. The project culminates in a formal summit where a health status report is presented to the community along with suggestions for improvement.